Applications on prescribed form are invited from the PERMANENT RESIDENTS of Jammu & Kashmir State possessing the prescribed academic qualification and age for the posts of Dental Specialist (B Grade Specialist Dentistry)/Consultant in Health & Medical Education (Family Welfare) Department as per the category-wise break-up tabulated below. QUALIFICATION : Possession of Post Graduate qualification in Dentistry recognized by Dental Council of India with three (03) years experience in a responsible position connected with the specialty. OR Possession of Post Graduate Diploma in Dentistry recognized by Dental Council of India with five (05) years experience in the profession in a responsible position connected with the specialty. Essential:- 1. A recognized BDS degree of Indian University or an equivalent qualification with at least one year experience, preferably in a recognized hospital. 2. Must be registered with Dental Council of India. Qualification:BDS Degree from a recognized University/Institution and must possess valid Registration Certificate from by BDS candidates. Must have registration receipt for DDC on day of interview. Pay Scale: PB-3 of Rs. 15600-39100+Grade Pay Rs. 5400 plus allowances as admissible under the rules. ELIGIBILITY : A. EDUCATIONAL (i) BDS from a recognized University or Equivalent preferably with MBBS from a recognized University or equivalent. 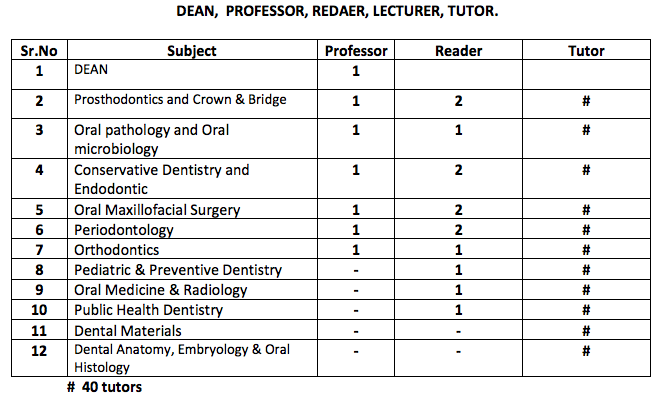 (ii) Postgraduate qualification in the relevant subject(i.e.Dentistry) from a recognized University or equivalent. Three years teaching experience in the subject in a recognized Medical College as Resident/Registrar/Demonstrator/Lecturer/Tutor. College of Dental Sciences Managed by K.J.Mehta T.B.Hospital Trust requires Professor-Reader-Lecturer-Tutor in all the departments of the college. DEAN : EXPERIENCED PROFEESOR OF ANY DENTAL SUBJECT IS ELIGIBILE. post-graduate qualification + 5 years teaching experience as Reader. post-graduate qualification + 4 years teaching experience after post-graduation. 4.TUTOR A BDS Degree of an Indian university or an equivalent qualification. + 1 year experience. 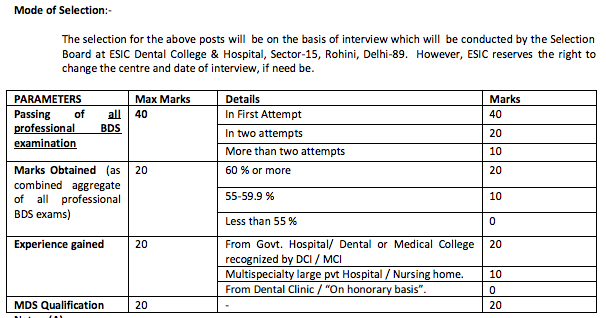 Guru Gobind Singh Govt Hospital, Delhi has issued notification for the recruitment of 24 Junior Resident Posts. Age Limit: Age should be 40 years for General Candidates, 45 years for SC/ ST, 43 years for OBC, for PH relaxation of 10 years as per provision, on the closing date for submission application. Educational Qualification: Candidates should possess M.B.B.S. degree with PG/ Diploma/ DNB in concerned specialty from a recognized university/ Institution and should have a valid registration with Delhi Medical Council for Senior Resident, MBBS Degree from a recognized University/ BDS Degree from a recognized University and must possess valid Registration Certificate from DMC/ Delhi Dental Council for Junior Resident. Here is the complete examination schedule for all the upcoming examsGOOD LUCK !! !